What do Jewish history and the Bold and the Beautiful have in common? They’re both filled with lots of drama and family infighting, and have endured for a long time. The thing is – while soap operas thrive on drama and fighting on camera, we Jews don’t need to air our dirty laundry on international TV. We can deal with issues within the family. Since this is actually the first time Women of the Wall has consented to sit down together with Women For the Wall, we can even call this the first session of family therapy. I’ve heard many attempts to explain why we created Women For the Wall, from “we’re upset Chareidi parties aren’t in the government,” to “we had to take the law in our hands, once Judge Sobel said WOW could hold services in the Women’s section.” These are so off the mark it’s ridiculous. Why did we create Women For the Wall? Primarily for one reason: we long for unity in the Jewish nation, and were incredibly pained when we saw WoW slander Israel and traditional Jewish practice — not only to the international media, but to all of you, as well. One of the few things most successful at giving the next young generation a feeling of Jewish identity — is their connection to Israel. The Pew Report reminds us that the Jewish world is in crisis. So when Anat Hoffman and other WOW board members mistakenly compare Israel to Saudi Arabia, claim that women here are oppressed and have no rights, and that Conservative and Reform Jews get arrested for praying in their way, it’s doing irreparable harm to our nation. That is why we started our group: because we were distressed that WoW was driving a wedge between American Jews and Israel. I come from a family that is as diverse as any – I have close relatives in the Reform movement and in Bnei Brak. Fighting and intolerance between groups of Jews pains me to no end. I teach my children to love and respect Jews of every stripe and belief. WoW is fanning the flames of disunity, and in the very place that has unified us as a Jewish nation. They present themselves as fighting for religious freedom, civil rights, and women’s rights. We started Women For the Wall to represent the vast majority of regular female Wall-goers who feel their rights are not being fought for, but trampled upon. This is Jerusalem, not Selma, and this isn’t an issue of women’s rights, but religious ideology. In most situations, no one would accommodate a small group that tried to impose their views onto the majority. Yet the Israeli government has gone above and beyond, because they care about Jewish unity and maintaining the Jewish connection to the land of Israel. Our team met with Cabinet Secretary Avichai Mandelblit just last week. We feel the government is sincere about finding a solution that works for everyone. They spent a lot of money on the Robinson’s Arch/Ezrat Yisrael section, and are prepared to spend even more to accommodate worshipers at this alternative prayer section, along the same holy Western Wall. The Conservative movement has accepted this proposal. The Reform movement has responded positively. Jerry Silverman and the Federations are supportive… but not the Women of the Wall. 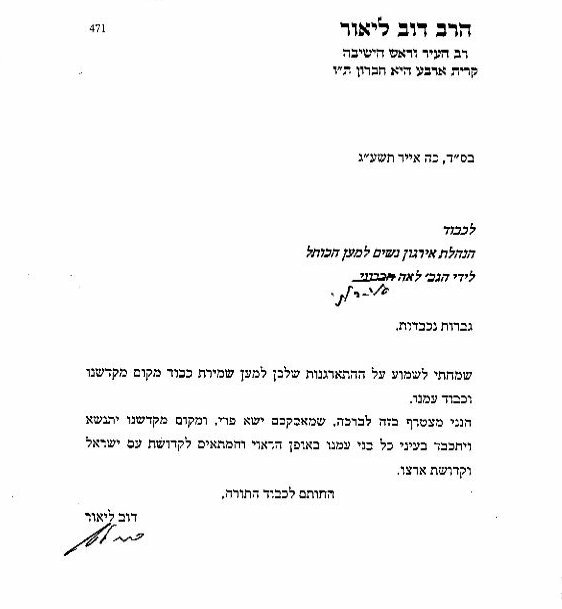 After rejecting compromise and holding a sit-in at the Wall, WOW announced a change of course: they’ll enter negotiations regarding Ezrat Yisrael, after the government agrees to a list of 16 untenable demands. Other WoW visionaries, including founders and former board members, say they will never leave the traditional Women’s section. Are there prayers held here at the GA? Binyanei HaUma is a public building. Imagine if I organized 15 chassidim to come into those services, and begin a competing prayer service in an attempt to change you. Would that not be offensive? Because that is exactly what the Women of the Wall are doing — each and every month. I admire their passion, but I strongly disagree with what they are doing. That’s because I support freedom of religion. Jews come to pray at the Western Wall to connect to God and thousands of years of Judaism. After the Kotel was liberated during the Six Day War, the traditional plaza was built, with a Mechitza. Why a Mechitzah? It’s simple, really. Secular Tel Aviv has 500 synagogues you’d call Orthodox, and one Reform temple. The Kotel is run as it is because Israelis, religious and not, expect it to be run that way. The old photos you’ve seen of people praying at the Kotel with no Mechitzah, are because during Ottoman and British oppression, Jews in “Palestine” were not allowed to pray freely at the site. The Mechitzah is a symbol of our freedom to worship in the traditional fashion. In places revered by other religions, such as the Al Aqsa Mosque and the Vatican, there are rules that maintain the traditions of the place. If the Kotel plaza were run like a “national monument” as Ms. Hoffman has proposed, it would lose the very atmosphere for which people come. So you choose. Anyone can go to the traditional plaza, and there’s no rule that says Reform Jews can’t pray traditionally for an hour. But if you want to pray differently, then there’s a place for that, too. The answer is not to let a tiny but vocal minority ruin the experience for everyone else. Believe it or not, the Kotel plaza is run as a compromise – like any synagogue rabbi, the Rabbi of the Kotel gets it from all sides! As a result, it remains a place where Jews from across the religious spectrum can come and pray. Women of the Wall should move now to the platform [Minister of Religious Services Naftali] Bennet built in Ezrat Yisrael, to have their non-traditional prayer services. They should not be making demands that their numbers do not justify. For the sake of Am Yisrael. For the sake of Jewish unity. For the sake of allowing everyone their religious rights, and not insisting on doing things their way and trampling on the rights of others. 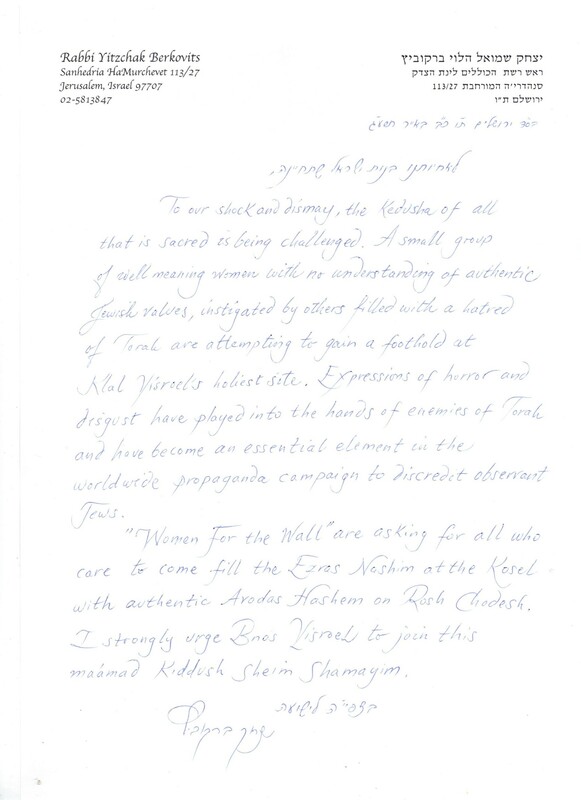 Ronit Peskin and like-minded people are making a basic mistake when dealing with the “Women of the Wall”.These women have their own agendas and they are not interested in “being reasonable” and their intention is to “trample on the rights of others”. The recent articles about the links the leaders have with far-left anti-Israel NGO’s such as Adalah, Ir Amin, Yesh Din, Mossawa, Sikkuy, the Domari Society of Gypsies, part of Al Aqsa Grassroots, and Women in Black, shows that we are dealing with tough, experienced activists. Sincere, spiritually-motivated people would never behave the way these women behave. You only have to see the video clips which show their clowning, dancing and singing loudly and blowing kisses to understand the type of personality we are dealing with. That they had to import over 100 people from the USA at a cost of nearly $150,000 to boost their numbers shows that they realise that they losers. The very idea that 90 women who come to the Kottel for 11 hours a year can impose their ideas on the 100’s of thousands is simply ridiculous. Boris, we don’t think there is much chance of changing WoW- they are very set in their ways. What we can do is speak to their supporters, and show them the truth about what is really going on… and when they see the truth, they often switch sides. Having recently made Aliyah from Canada, I was excited with the opportunity to daven my first Rosh Chodesh at the Kotel. Unfortunately, I was barely able to get through my prayers. The association of Women of the Wall arrived, offering to take pictures with me and making the same offer to young seminary girls. Their overly loud singing, lifting each other up on chairs, swinging Torah covers left me in tears. I had no rights at the Kotel that morning, they were stolen from me. Ronit, for such a young woman you have great clarity and wisdom. time and effort on behalf of klal Israel. Well done op-ed piece! I am a member of a small (very small) jewish community here in Ketchikan. You have our prayers!